This pattern is worked from bottom upward and crocheted in round to make a pocket. The back of the pocket then is lengthened to make the flap. Inactive on Ravelry due to technical problem with payment method. Sorry for the inconvenience. Make them in any color combination you wish for a unique tote of yours. Special thanks to Zelna Olivier at http://zootyowlcards.blogspot.com, Oona Linet, and Kalpana Chitharanjan who kindly tested this pattern. Made with lightweight yarn, this hat is perfect for any seasons. Designed for the young girls to teenagers alike and anyone who feel young at heart. 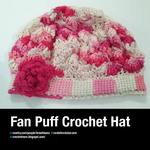 While hat is made in puffy shell motive, the brim is made in simple Tunisian stitch. This pattern has not been tested. Although I have been vigorously testing it myself at least for three times but I can still make mistakes. If you are downloading it please do give me some feedback. I’d appreciate it very much. 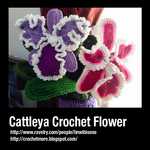 Make this crochet applique flower in any color combination you desire, and work it onto a cushion cover, use it as border for doilies, or make many to create pretty bag. Coasters can be made with or without edging using any yarn of your choice. The final size will depends on the thickness of the yarn being used.